Jane has had a long term interest in helping young scientists gain the skills needed to make an informed decision about whether they want a career in academia. In 2006 she designed and ran a skills training program for postdocs in the Plant Sciences Department, that comprised 20 two hour interactive workshops. The program runs every two years. The success of the program led to the Maths, Physical and Life Sciences Division appointing an Academic Advisor, Barbara Gabrys, to deliver the program across the 10 constituent Departments in the Division. In 2011, Jane and Barbara co-authored a book based on the workshops. 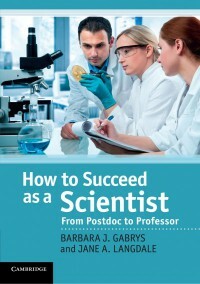 The book is a practical guide for postdocs and students that suggests ways to gain the necessary research tools and working skills to build a career in academia and beyond. It also provides a useful framework for senior academics who wish to run training workshops in their own institutions.